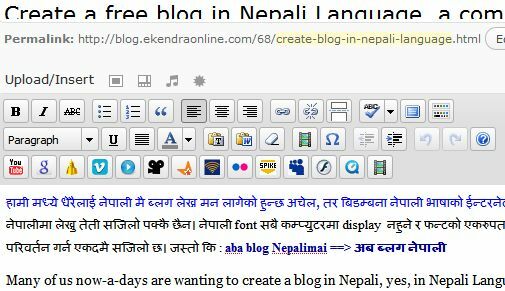 Many of us now-a-days are wanting to create a blog in Nepali, yes, in Nepali Language. In fact, there is not exactly such thing in Nepali when it comes to Nepali Language interface, but we can successfully write blog posts and most, if not all, texts shown to user pages in Nepali. It’s rather simple. Get started now. First of all, you need to sign in to a blogging platform or the host for free blog eg WordPress.com, Blogger.com or similar services or you could host on your own server eg WordPress.org, TypePad.com or similar services. The later one may involve you to purchase a domain (eg ekendraonline.com) and a hosting server space (eg bluehost.com). Sign up or create a free account with wordpress.org or blogger or something like free services. 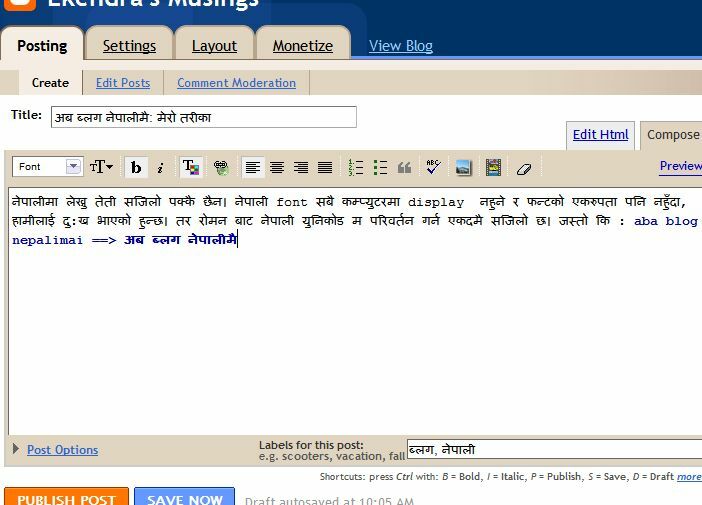 Assumed that you created a blog in Nepali, time to make your first blog post in Nepali. Open Create New Post and then in the Roman to Nepali Unicode Converter page (you just opened in previous step) write your title (see the screenshot). Similarly, enter the post contents including pictures and videos. You can also include categories and tags in Nepali.